SPARKLE: A ready to use glass cleaner with ammonia. SPARKLE CONCENTRATE: A 30:1 dilution ratio yields the same finished product as Sparkle. 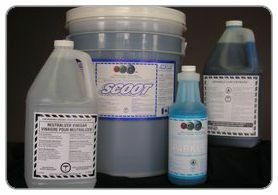 SCOOT: A non ammoniated glass and hard surface cleaner with a refreshing apple scent. Excellent on all glass, porcelain, chrome, counter tops and appliances. VINEGAR: Product is available in ready to use and concentrated Acetic Acid. (20:1 dilution) This product is not for food use.